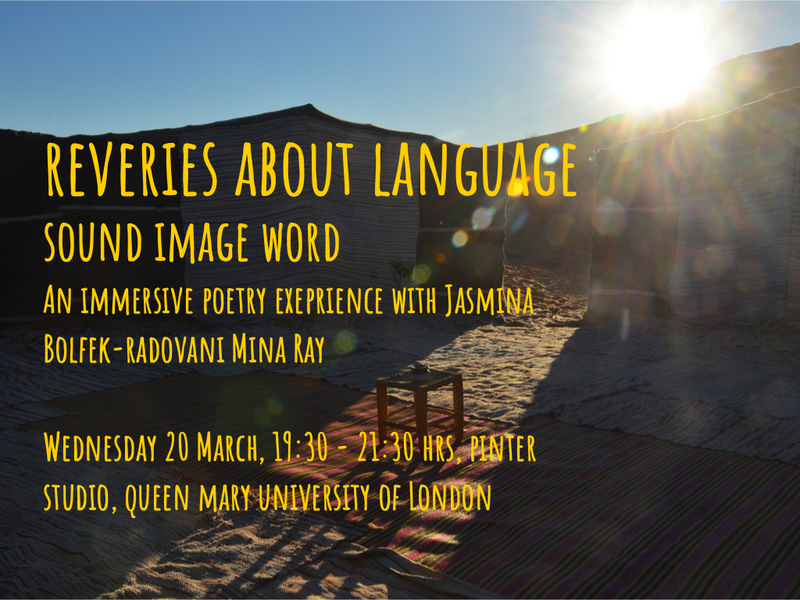 Immerse yourself fully in an evening of multilingual poetry and experience the world(s) of the multilingual poet Jasmina Bolfek-Radovani Mina Ray through sound, image and word. Registration for the event is FREE. Register via Eventbrite HERE. ‘Reveries about Language’ is the first in a series of immersive live performances conceived as part of the multilingual poetry project ‘Unbound’*. ‘Reveries’ is imagined as a multitude of sonic, visual and textual ‘promenades’ inviting the public to immerse themselves in the multi-sensorial experiences of poetry in English, French and Croatian. These multilingual poetry, multimedia performances aim to show how the spoken word, sound and image can interact in an innovative way to create a series of ‘unbound’ or free expressions. The evening will begin with the performance lasting for 50 minutes, followed by refreshments and 20 min conversation between the performance director Professor Catherine Boyle and the poet Jasmina Bolfek-Radovani Mina Ray, the sound artist Alo Allik improvising music on stage and the multilingual actors performing the poetry in English, Croatian and French. Jasmina Bolfek-Radovani (pen name: Mina Ray) is a poet of Croatian and Algerian heritage working in London. She is interested in the relationship between language, identity and space and the experimentation with multilinguality in her writing. Her poetry has been published in the UK, Croatia, France and Canada. Jasmina holds a PhD in Francophone literary and cultural studies; she has given many national and international papers and has published several peer-reviewed articles in her field. She is the author of the multilingual poetry project ‘Unbound’. Catherine Boyle is Professor of Latin American Cultural Studies at King’s College London. She has published widely on Latin American culture, theatre and performance and women’s writing and gender. She is a translator of Latin American theatre and poetry. Catherine Boyle is the Principal Investigator for Language Acts and Worldmaking and the project’s strand lead for Translation Acts. Alo Allik is an Estonian sound artist who has performed his live coded electronic music and generative computer graphics throughout the world. His aesthetically and geographically restless lifestyle has enabled him to traverse a diverse range of musical worlds including DJ-ing electronic dance music, live electronic jam sessions, electroacoustic composition, free improvisation and audiovisual performances. Alo is a postdoctoral researcher at the Centre 4 Digital Music, Queen Mary University of London since 2015. Pierre Elliot is an actor and a native French speaker based in London. He has recently graduated from the Guildhall School of Music and Drama and has worked with BBC4 radio since then. Robert Šantek is a freelance voice-over artist and radio host at Yammat FMradio, Zagreb, Croatia. Parallel to his voice acting in television, animated movies and commercials he has worked as a translator, interpreter and as screen writer for television gameshows. He grew up bilingual (Croatian and German) and is fluent in French and English. In his free time he sings in the Early Music Consort “Otium”. Emily-Celine Thompson trained at Guildhall school of Music and Drama on their three year acting course, and also graduated with distinction and a first class degree in French and Drama from Bristol university. She is half French, but has been brought up and lived in London for most of her life when her family moved here. *Unbound is a new creative project across several European countries by the multilingual poet Jasmina Bolfek-Radovani Mina Ray. It explores contemporary poetry writing in the context of multilingualism and across different media.